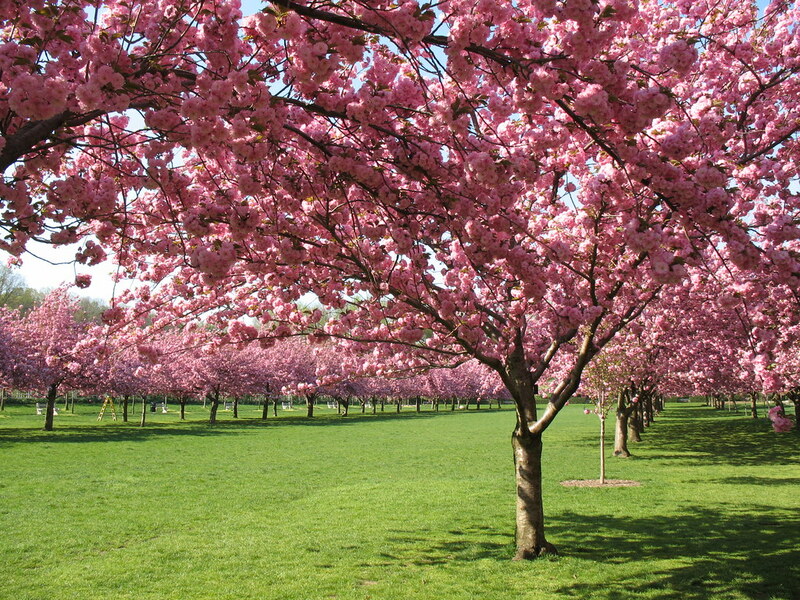 Cherry Esplanade is a broad green field bordered by allées of the dazzling Prunus 'Kanzan'. One of the highlights of the cherry blossom season, these double-flowering cherries typically bloom at the end of April and are a prelude to the Garden’s annual cherry blossom festival, Sakura Matsuri. 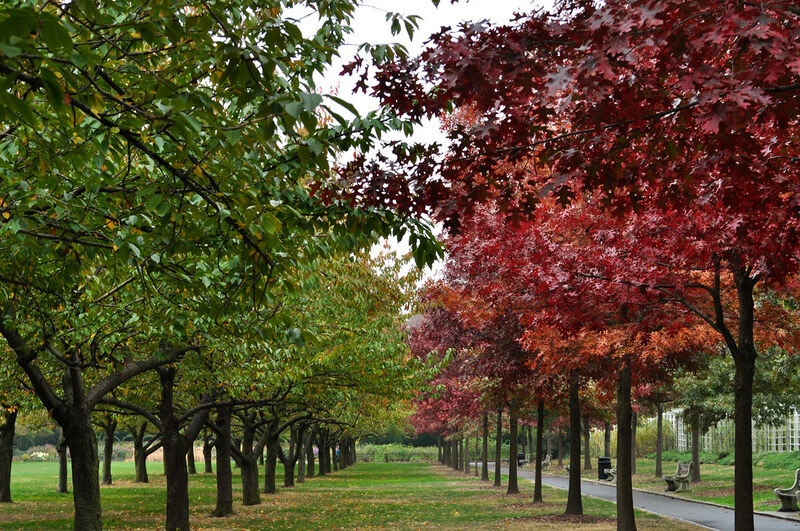 Along the eastern and western edges of Cherry Esplanade are allées of scarlet oak trees, the Liberty Oaks, planted in remembrance of the events of September 11, 2001, and to those who lost their lives that day. The Liberty Oaks replaced a similar installation of Norway maples, planted in commemoration of the WWI Armistice. 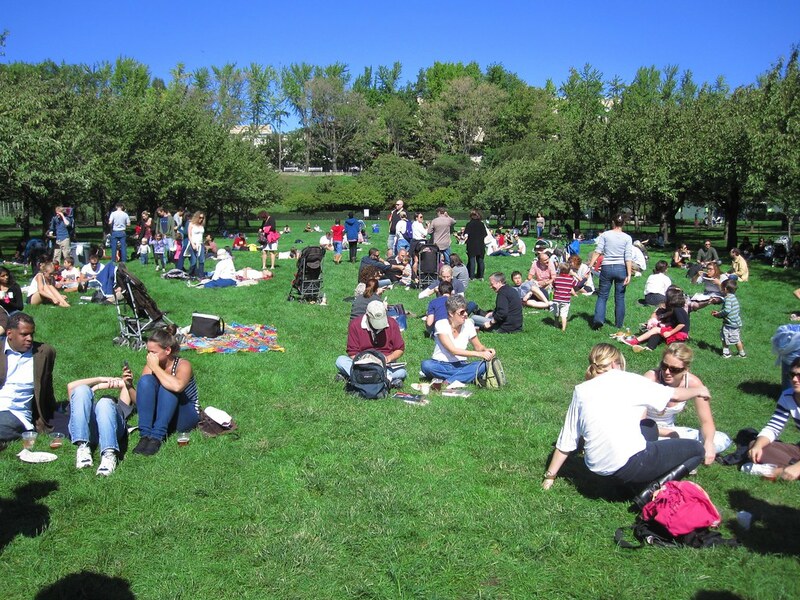 The Cherry Esplanade lawn is composed of eight kinds of grass, adapted for full sun as well as the shade of the leafy trees. This is the only part of the Garden where visitors can sit on the grass; BBG members often enjoy summer picnic nights here, the only time picnicking is allowed. Cherry Walk is a gently meandering path east of Cherry Esplanade and behind the Japanese Hill-and-Pond Garden. The cherries here, also a mixture of 'Kanzan' and other cultivars, were originally purchased for the Garden by the BBG Auxiliary from a Long Island nursery in 1921; two from the original planting still survive. Several of the trees here are the earliest to bloom during the cherry blossom season. This pathway displays a selection from the Garden's 42 culitvars of ornamental flowering cherries and is one of the foremost cherry-viewing sites outside Japan. 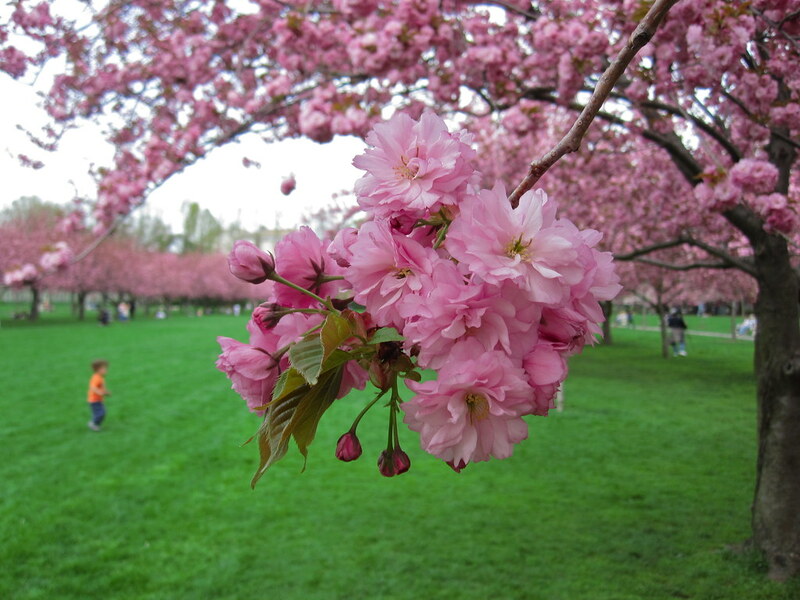 The monthlong cherry blossom season, called Hanami, is a centuries-old Japanese tradition of flower viewing. The blossoms are symbols of isagiyosa, the transience of life, meant to be cherished without trying to hold on to their evanescent beauty. 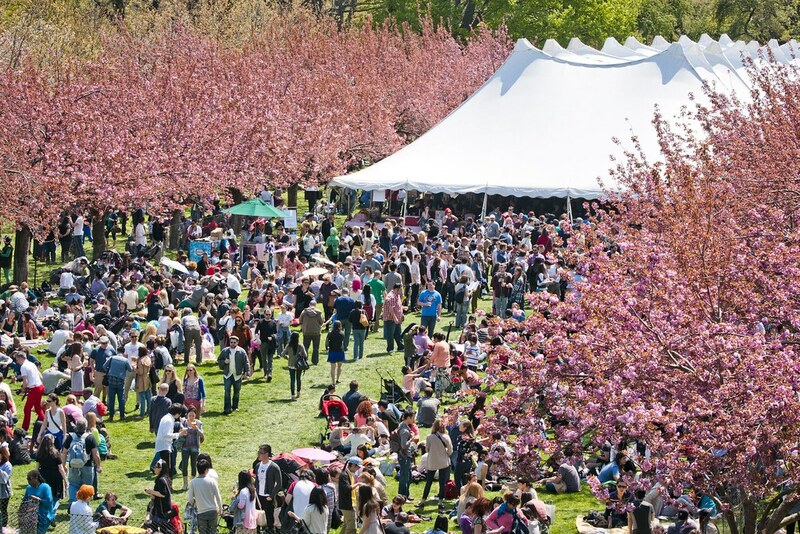 Sakura Matsuri is a weekend festival held each spring at BBG since the early 1980s that celebrates Japanese culture through music, dance, food, and art for visitors of all ages. To view more photos from the 2010 Sakura Matsuri, visit Photos from Sakura. Seventy-six double-flowered Prunus ‘Kazan’ trees line Cherry Esplanade and create a dazzling spring display. Along Cherry Walk and in other parts of the Garden, more than 40 other cultivars of oriental flowering cherries make BBG one of the foremost sites for viewing cherry blossoms outside Japan. 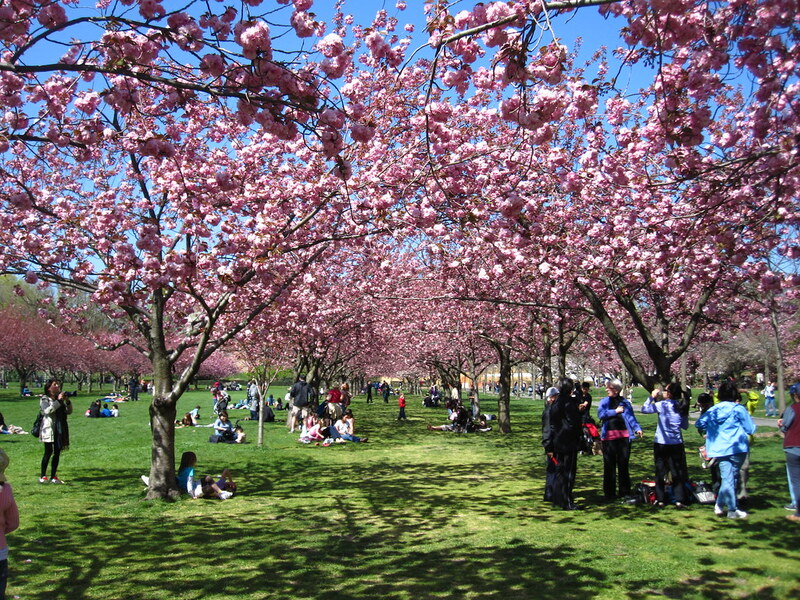 Cherry Walk was planted in 1921 and quickly became known as one of the best sites to view cherry blossoms in North America. 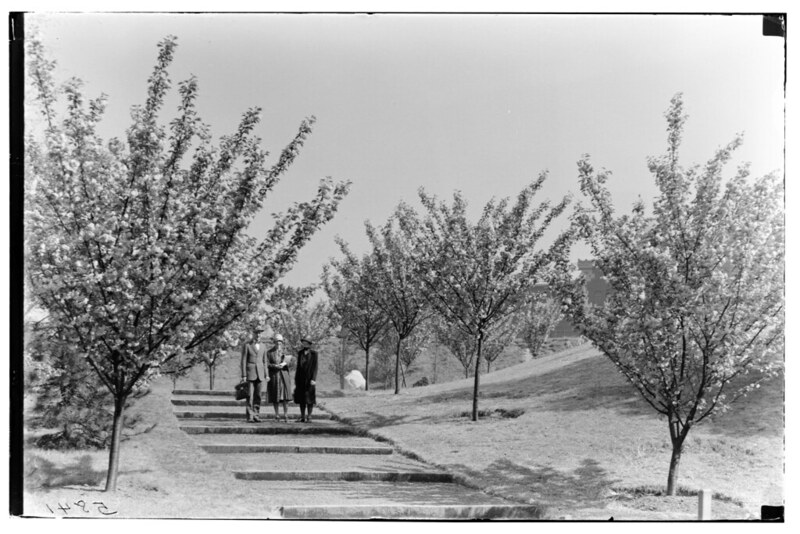 The installation of the allées of Prunus ‘Kanzan’ on Cherry Esplanade in 1941 increased the Garden's reputation for spectacular spring displays, and since 1982 it has been the centerpiece of Sakura Matsuri, the Garden's annual cherry blossom festival. Cherry Esplanade. Photo by Rebecca Bullene. Cherry Esplanade. Photo by Mike Ratliff. 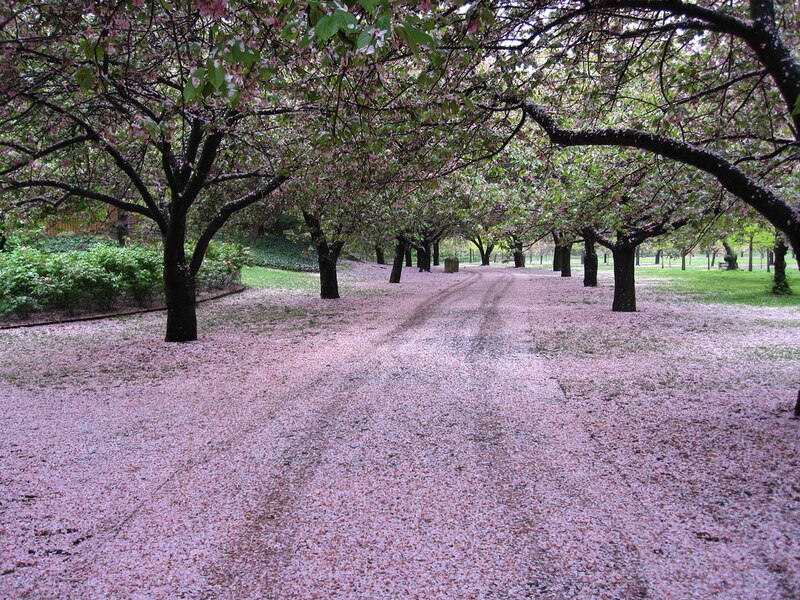 Cherry Walk at Brooklyn Botanic Garden looking more like petal road. Photo by Rebecca Bullene. Visitors taking a break from the fiesta on Cherry Esplanade. Photo by Dave Allen. Cherry Esplanade in autumn. Photo by Blanca Begert.